Wayback machine can be considered as the best web archiving site with over million of users every day. Numerous businesses depend on it for developing business strategies and also to understand their competitors. Wayback machine allows any user to see historical details, development & modification of any website. It has innumerable uses like getting details or understanding competitor’s development. Also, provides access to deleted information and allows you to have access to the content of down websites too. Frequent access to wayback machine is paramount, as it can be proved as a loophole in critical situations. The major drawback of wayback machine is that you will find it frequently down. And therefore it’s nice to have other options ready. 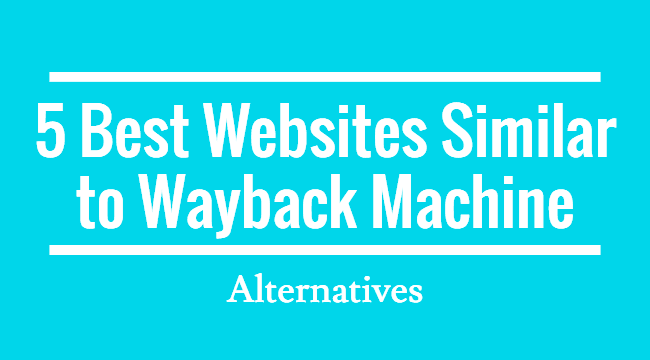 This article is all about the alternatives for wayback machine which is going to be very helpful when wayback machine is down, and you are in need of it. Here, few alternatives of wayback machine are given which has some salient features & may be useful to you. So here we go. Screenshots can be called as a good alternative to the wayback machine. It helps you to know how actually a website looked in the past. As its name itself says, screenshot just takes a snapshot and save it to the database, and you can have access to it. It performs very less function than what wayback machine does but still can be of great use when wayback machine is down. Screenshots make use of WHOIS database of domain tools to archive websites and makes a record of snapshots. The frequency through which it takes screenshots depend on upon the number of time site has been updated. The salient feature of screenshots which make it unique is that it takes a snapshot of a site instead of copying it. It is more accurate and precise form of storage. Moreover, it is very easy to use and does not need any special lessons to use it. Anyone can learn it quickly; that’s how simple it is. Along with the facility of good record storing it has a very simple interface. Besides, it offers you with the complete WHOIS record for the domain. The major drawback of screenshots is that its frequency is less and does not support less popular websites. Archive.is is one of the most recommended alternatives of wayback machine. The functionality which is offered by Archive.is is just outstanding. No other option provides such functionality. Navigation is straightforward & easy to use. It allows you to search for a web history and to take a snapshot of any domain as well which are allowable for everyone to see it. It lets you have access to every small detail from data to graphical. The salient feature of Archive.is is its ability to capture screenshots and website history. Moreover, you can request to archive any site at any time. All these features of the archive.is make it unique. It provides the user with all the necessary information about any domain name at any time. This site accesses Alexa database. Having access to the archive tools is very simple in iTools. The remarkable feature which makes it unique is that it will also let you know about the popularity of the website, traffic to which site comes across, and details about the competitors. It's one of the most trustable alternatives of wayback machine. The specialty of competitor screenshots is that you can find screenshots of any website here. This helps you to have a quick view of any site over here. You can even access those screen shots and email them too. But to have access to emails and screenshots you need to sign in. What you need to do is just get yourself registered on this website, and you can have access to all the amazing features this site provides you with. This site offers you a broad area of functionality, which can be proved very useful and helpful in extending your business. What makes this website unique is that you can look over archive contents on this site, and it also helps you to see your competitors. This site is very easy and straightforward to use so any expert is not needed to work on it. So its good accessibility makes it preferable to use. Thus, when in any case, you find wayback machine down then don't need to worry. There are many good options that too with different features and specialties. You can choose any of the tools mentioned above on the basis of features & your requirements. So, from now on, no need to worry even if wayback machine is down.